Chris Wilder has warned play-off chasing Exeter City there will be no let-up from the Cobblers at St James Park on Saturday. Town secured promotion with their 2-2 draw with Bristol Rovers, but Wilder says the foot won’t be taken off the pedal as his team chase the Sky Bet League Two title. This is another battle of two in-form teams, with the Cobblers unbeaten since December 19, and the Grecians since February 23. Exeter are making a real charge for the promotion play-offs and have won four of their past five matches. In their most recent home game they beat Devon rivals Plymouth Argyle 2-1, and Wilder knows his team are going to face a real battle. “Exeter are a good side, in good form,” said the Cobblers boss. “They have turned a couple of the teams over that are in and around it recently, and are coming with a late charge. “There is always a team that comes out of the pack, but there are a few teams involved and I think it is a really exciting end to the season. “The results Exeter have had recently have been top drawer, and they will want to carry that on. It is the latest in a long lost of ‘big games’ for the Cobblers, who will be again be backed by a large away following. Last week they faced a Bristol Rovers team that had won seven of their previous eight matches, this week they face an Exeter side unbeaten in nine, but Wilder insists it makes no difference to him or his players who is put in front of them. 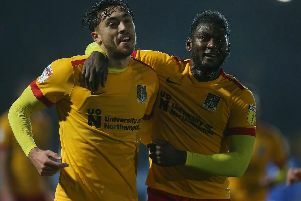 “It makes no odds whether we are playing Exeter City, Bristol Rovers, Dagenham & Redbridge or any team that is wanting to stay in the division,” said the Cobblers boss. “It has always been about us and our focus and going for the game, and we will do that yet again. “I will respect Exeter, as I have done Bristol Rovers and the other 22 clubs in this division, and that is the way we work. “If we don’t get the result that we want to at Exeter, then we will move on to the next one, but these players will be focused for the game. “We will be taking another great travelling crowd with us, I am sure there will be more than 1,000 of our punters down there on Saturday. Wilder admits he is a huge admirer of Exeter boss Paul Tisdale, who is the second longest serving manager in English football. Only Arsenal’s Arsene Wenger has been in his job longer than the nine years 294 days that Tisdale has, and Wilder feels he deserves huge credit. “In an era where managers get fired pretty quicky, Paul has been in the job for a long time and he does a lot of good things down there,” said the Cobblers boss, who is the 22nd longest serving boss in the country. “He does a lot of good things with his team, and they are a solid football club. “They have to sell a player along the way, and they have a couple now that they most probably will, but that is how they work and they move on and go again. “They are always a competitive team that plays really good football. “I talk to Paul quite often, he is a good guy and I will wish him all the best after Saturday.